Download a PDF of the speech. Gov. 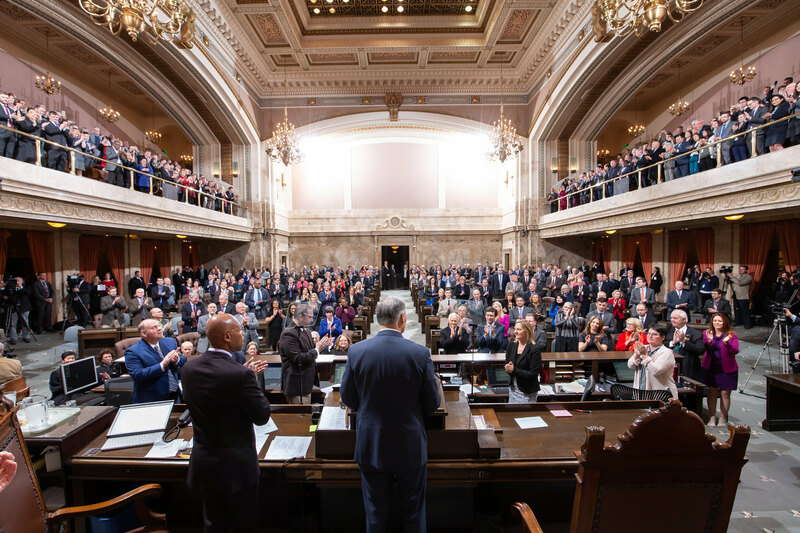 Jay Inslee today delivered his 2019 State of the State address to a joint session of the Washington State Senate and House of Representatives. He implored legislators to write a historic new chapter in Washington’s story that demonstrates bold purpose in acting on climate change, transforming the state’s behavioral health system, protecting the embattled Southern Resident orca population, and continuing important investments in education. Inslee called on legislators to take Washington's progress to the next step. “In 2019, we are again poised to be more and do more," Inslee said. "Yes, we’ve accomplished much already. But all of it — everything we’ve done — brings us to a tipping point.” He laid out a series of measures he hopes legislators will act on in the 105-day session. Thank you, Rabbi Dunsker, for your inspiring words. Thank you, Sergeant Scheer, for the beautiful rendition of the national anthem and for your service in the Army National Guard. I extend a warm welcome to former Governor Gary Locke here today and thank him for his service as well. I welcome the new legislators in your ranks who have stepped up to serve the people of this state. I congratulate your families who will be part of your adventure. And I thank my wife, Trudi, and my entire family for joining me on my adventure. I’m pleased to note a couple historic firsts in this Legislature. The people of Washington elected the first Native American woman to the House, Representative Debra Lekanoff. And they elected the first refugee, Representative My-Linh Thai, to the Legislature. These are firsts we all are proud of. Mr. President, Mr. Speaker, Madam Chief Justice, distinguished justices of the court, members of the Legislature, tribal leaders, state and local government officials, members of the Consular Corps, and most importantly, my fellow Washingtonians. Today, we gather in a place that tells much of our Washington story. Today, we come together from across the state — from the rolling hills of the Palouse to the coastal rocks of La Push — to find inspiration for the work we do. And today, as we reflect on our 2018 successes, we look ahead to 2019 and offer a rallying cry to build this new and enduring chapter that is the profound story of Washington state. Our story already reflects optimism and strength. But as Washington’s leaders, we carry an obligation to never be satisfied with how far we’ve come. He was right. Our state history offers example after example of leaders willing to do more and to be more — even after they toppled barriers and shattered expectations. Did Bill Gates and Paul Allen stop after forever changing the world of personal computing? No. They kept asking “what if?” and not only built on the landscape of the technological world, but delved deep into science, medical research and culture and redefined what giving back means. Did Steve Gleason, one of the best Cougars out there, stop after he blocked that punt during the 2006 New Orleans Saints game? No. Congress just awarded him the Congressional Gold Medal for his advocacy for people with Lou Gehrig’s disease, something he works through every single day. Did Tarra Simmons of Bremerton quit after she redirected her life while serving time in prison? No. She earned a prestigious fellowship, graduated from Seattle University School of Law, and when told she couldn’t fulfill her ultimate dream of being a lawyer, she appealed to the state’s highest court so she could take the bar exam. Today, she practices law and helps others find a second chance after incarceration. We’re glad she can join us today. We are drawn to stories about people who don’t quit. They call to us because they remind us we have the same promise for greatness. In 2019, we are again poised to be more and do more. Yes, we’ve accomplished much already. But all of it — everything we’ve done — brings us to a tipping point. - One, do we reflect on the success of our current story and decide we’ve done enough? - Or two, do we rise up to write one of the worthiest chapters of our time that tells future generations who we are? Though we’ve accomplished much, we still face challenges that require us to push further. At the top of that list is the imminent threat of climate change. In just the past few years, our state experienced record-high temperatures, record-low snowpack in some locations, higher ocean temperatures and high acidity in our waters. Historic wildfires blackened our air so much that we had the worst air quality in the world. Not China, not India. Washington state. The smoke shut down outdoor pools in Wenatchee, and impacted all of us, forcing kids and older adults to stay inside to protect their health. Scientists say if we don’t act now, this will become the norm — a permanent degradation of what we love, our magnificent state. I don’t know of any other issue that touches the heart of things so many of us care about: our jobs, our health, our safety and our children’s future. But this doesn't have to be our future. Science affirms the necessity of action — this day. This is the 11thhour, but it is Washington’s hour to shine. It’s a time of great peril, but also of great promise. Clean energy and low-carbon technologies are increasingly competitive in the marketplace. Innovation brings us cleaner, cheaper, better fossil-fuel alternatives every day. This innovation benefits our rural economies as much as our urban and suburban economies. Just last year, I helped cut the ribbon for our state’s largest solar array in the small town of Lind. I was joined by Senator Schoesler and Representatives Dye and Schmick to celebrate the good-paying jobs the project brings to their community. These kinds of jobs have propelled our clean energy sector to grow more than twice as fast as the rest of our economy. There is no greater job opportunity than the opportunity of clean energy. It’s why a historic alliance of labor and communities of color has joined with conservation and environmental groups to push for climate action. Looking at the many new faces in this chamber today, I am more optimistic than ever about the clean energy future we’ll build together. We will pass legislation to transition to 100 percent clean electricity, transform our buildings with cost-saving efficiencies, and modernize and electrify our transportation system. We’ll phase down super-pollutants and phase in cleaner fuels. This means by 2035, nearly all our electricity will come from solar, wind and hydroelectricity, instead of polluting fossil fuels. It means you’ll save money on lighting and heating costs because our homes and businesses will be much more energy efficient. It means our transportation system will be the cleanest in the United States because we’ll power it with clean electricity and clean fuels. Combined, these policies will steeply cut emissions — the equivalent of taking about 3 million cars off our roads. This transformation has started but we need to do more, do it bigger and do it faster. So when your grandchildren ask what you did to protect them from climate change, you can tell them you weren’t sitting around saying it was someone else’s problem. You took action. Because that is who we are in the state of Washington. It’s going to feel really good to be part of the solution. It’s going to feel really good to make history. Another historic chapter we need to write about is mental health. While we’ve taken significant steps to improve our physical health in medical schools like the Elson Floyd College of Medicine at WSU, we can improve our mental health care efforts, too. We need to transform behavioral health from a system that responds to crisis to one that helps people before they reach crisis. For those with a loved one who has waited too long for the right kind of treatment, we know this challenge is urgent. Our families and friends are suffering and we can do so much better. We must find room for hundreds of people at new community-based facilities so patients receive services in places close to their families, homes, places of worship and communities. We must also expand our professional workforce so patients are treated. That’s why I’m proud to pursue a new partnership with the University of Washington to create a teaching hospital to serve these patients and to train behavioral health providers using a unique new curriculum. We can turn this story around and direct it toward hope. And I’m pleased that we’re at the beginning of a bipartisan effort to do just that. We will create a story this year about a holistic model for behavioral health that encompasses the family, the community and the promise of timely care. The third thing we need to focus on is saving the Southern Resident orcas. Despite our orca task force already in place, the event that truly told the story of the orcas’ fate happened last summer. Many of us watched as Tahlequah, a mother orca, carried her dead calf for at least 17 days. We saw a mother’s grief. We felt it. Our hearts broke as we shared in her loss. This cannot be their fate. We must make unprecedented investments to save our orcas. The demise of any species is a warning in our natural systems. We have to restore the balance of our ecosystem to sustain orcas, salmon and the quality of life for all Washingtonians. For as the orca go, so go we. We’ve received thousands of calls from people around the world pleading for us to do more. Our orca task force, led by Dr. Les Purce and Stephanie Solien, has spent hundreds of hours researching the science behind survival. We thank you and the members of the task force. The actions we have to take, such as increasing salmon stocks, fixing culverts and decreasing vessel traffic risks, are hard but necessary. We have just one last chance to save these orcas. In this perilous moment, we must answer back with action. The fourth issue — one still at the forefront — is education. I thank everyone in this chamber who has been part of the years-long effort to fully fund basic education. This was an enormously heavy lift that I’m proud we accomplished together last year. This was a remarkable bipartisan effort; both parties shared in that success. But we have always said we couldn’t stop at basic education. For anyone who cares about equity in education, early learning is the best way to secure a strong start for every child, regardless of their family’s economic circumstances. We’re investing in children well before they enter the elementary school classroom for the first time. In the past six years we’ve nearly doubled the number of children in early learning programs to more than 15,000. My budget builds on that to expand preschool with a new ‘birth to 3’ preschool program. And it would create a statewide referral system to connect families with early learning services and facilities. My budget would also offer universal home visits. This gives every new parent the opportunity to get a visit from a nurse during the first few weeks back home with their newborn to share important information and build confidence. And once those children reach the other end of their education and prepare to graduate from high school, we want to open up as many pathways as possible, including apprenticeships, certificates and degrees. For high-school students or individuals who seek an experience outside a four-year program, our Career Connect Washington initiative gives them that option. It links students to real-world experience in careers that interest them. And we know that experience is invaluable. It gives them a better shot when they apply for that first job. My budget will provide 100,000 students over the next 10 years an option to dive into their interests through apprenticeships and paid internships, and fall in love with a career before they graduate. This means more Washington students can take advantage of great careers here at home in one of the best economies anywhere. Don’t our kids deserve that? We’re also supporting future students who want more education but can’t afford it. The Washington College Promise is our new statewide free college program that guarantees state financial aid to eligible students. We did this because a student’s financial challenges should not stand in the way of the pursuit of their dreams. As we grapple with these challenges in our state, we must also confront other forces seeking to undermine our progress. During the past two years, we’ve been challenged by federal actions that appeal more to our darker natures than our better angels. But we know that’s not who we are. We are going to write an even brighter chapter of our Washington story. We’re the state that invests in our people. That’s why we’re the only state that ranks as the best place to work and the best place to do business. What an incredible achievement. We’re the state significantly ramping up efforts to help struggling Washingtonians find stable, affordable housing. I propose using more than $400 million for chronically homeless individuals, homeless youth and unsheltered families with children. We’re the state offering to pardon thousands of people with misdemeanor marijuana convictions. We’re the state that’s going to tear down the systemic barriers to work and education faced by people of color, people with disabilities, veterans and women. Initiative 1000 is a well-reasoned approach to do just that. We’re the first state to pass a bill requiring net neutrality, which will guarantee free and open internet. And we’re the state pushing for broadband for Washingtonians who want to start a business or further their education — no matter where they live in the state. We’re the state that believes women and survivors deserve to be heard. We will make sure our policies set the expectation that every employee feels safe and welcome in the workplace. We’re the state that supports a woman’s right to make her own health care decisions. I promise you, we will always provide reproductive health services to women in our state. While too many in D.C. remain in the grips of the NRA, we’re the state that stands up for common-sense gun-safety reforms. We’ve closed background check loopholes, banned bump stocks and approved protective orders that keep guns away from people in crisis. And at that same time, we’re making sure students don’t worry more about bullying or gun violence than they do about their algebra homework. We’ve heard over and over what an impact a caring adult makes in a child’s life when the child is working through issues like depression, bullying or peer rejection. That’s why we’re committed to putting more social workers, counselors, psychologists and nurses in our schools. We’re the state that put a stop to the death penalty, and I hope this Legislature acts to definitively end this practice once and for all. We’re the state that updated deadly force laws and require training to help law enforcement officers de-escalate violence. Communities and much of law enforcement came together on this and produced a model for the country on how to have what can be a very difficult conversation. I tip my hat to the people involved who helped form these changes. While there has been an unprecedented assault on working families, we’re the state that protects workers’ rights. We built the best-in-the-nation paid family and medical leave program, we’re supporting long-term care planning and we will fight for a public health option to ensure health care for all. While other places close their borders and fear the unfamiliar, we’re the state that opens our communities to refugees seeking safety, shelter and sanctuary. While the president stokes fear of ‘the other’ at every opportunity, we’re the state that embraces our differences and diversity. I’m proud of the incredible diversity of the people we’re appointing to judicial benches, boards, commissions and cabinet agencies. We’re the state making sure our government looks like the people it serves. We’re the state that passed the Voting Rights Act. And while other states threw up barriers to suppress voting, we’re the state that passed a nation-leading Access to Democracy package to make sure more people cast their ballots, not fewer. All this builds toward our promise for greatness. We’re constantly refreshed with new ideas, new cultures, new communities and new technologies. We seek out new talent from the world’s many pockets because that makes Washington stronger. We affirm that diversity is a strength, not a weakness. It’s the collective stories of all — the story of the refugee from Vietnam and the story of the third-generation Chelan orchardist — that ground us in longstanding Washington values. Now I know the things we’re proposing this year are not small or easy. But good things in our story haven’t happened through timidity. They happened because of our optimism and bold action. Good things in our story happened because we didn’t give up. Again, I ask you: Which Washington story will prevail? A story where we rested on our laurels? Or the story where we rose up, called out and wrote a golden chapter that’s worthy of our best selves? ... And more than anything, this chapter will show the heart of who we are. We’re the people who always make history. I really believe in the state of Washington. And I believe our next Washington chapter must show that we pushed the limit and moved beyond our plateau, that we always looked for the next beginning. So let this be our profound story. Let it be bold. And most of all, let it make history.